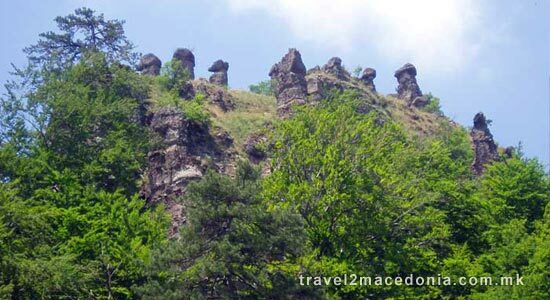 The Konopiste stone columns can be found hidden in the rocky hills of the Kožuf Mountain, southern of Kavadarci, near the village Konopiste. The Konopiste stone columns are 20, high above 20 meters and exist on this region for many centuries. Not everybody has heard for the existence of these stone columns, called by the local population Kanjata or Cucki (Tzutzki). The Konopiste stone columns are protected as a monument of the nature. But anyway nobody pays them any attention, there is not asphalt road leading to them, not even a sign. To approach to this location first you must cross the river Boshavica. After you cross this river as you have entered a whole new world. The entire terrain is fill of trees and bushes. After spending few minutes walking through them, there they are. The locals say: "The view of them is very beautiful in winter and in autumn, period when the trees do not have leaves." According to Goran Todorov, citizen of Konopiste the stone columns have always been helping those who were incapable of having children. He speaks about the legends related to the columns. The first legends of Konopiste stone columns is that everyone who is incapable of having children has to scratch a piece of the columns, then to put into milk, add some honey and drink it. Many people who were having problems have visited the Konopiste stone columns. The other legend of Konopiste stone columns is that the columns are radiating some special energy, so the young couples should have the act of love in front of them, so the stone columns can help in the production process. Places like this on the Balkans, can be found in Serbia (City of Devils) and in Bulgaria (Pyramids of Melnik - Pirin Macedonia region).